Darrion Caldwell wanted to make a statement Friday at Bellator 151, and boy, he did exactly that. The former NCAA champion put on a flawless performance against the toughest test of his career, manhandling Joe Warren before choking the former Bellator two-division beltholder out cold with an early rear-naked choke. Afterward, Caldwell turned his attention toward Bellator bantamweight champion Marcos Galvao. “You’re a pu**y!” Caldwell shouted to Galvao, who last week withdrew from his Bellator 150 title defense a day before the event due to illness. 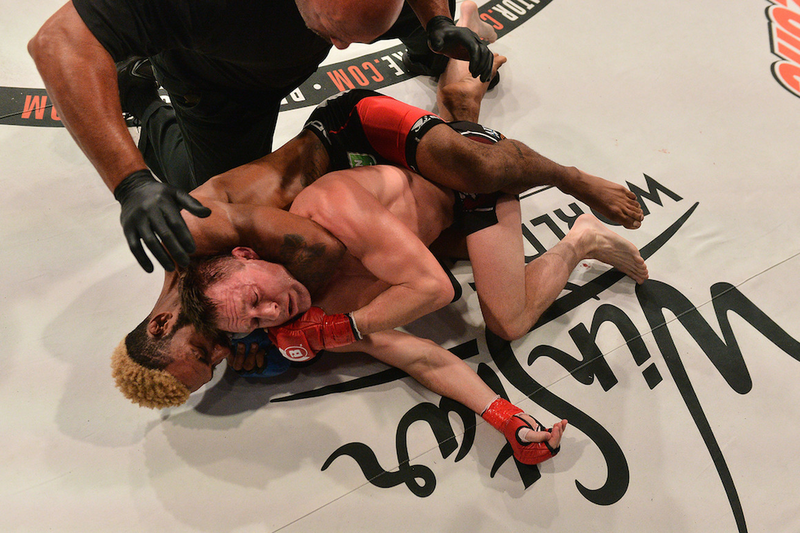 Caldwell (9-0) has long been discussed as the future of Bellator’s bantamweight division, and on Friday he showed why. The 28-year-old was an overwhelming physical force from the opening bell, landing takedowns at will, then slamming Warren to the mat with a massive suplex. From there the rest was a formality; Caldwell lunged onto Warren’s back and locked up the fight-ending choke, coaxing Warren to sleep before referee Dan Miragliotta could realize the fight had ended. Caldwell’s latest win pushes him to 6-0 inside the Bellator cage, and with four first-round submissions to his credit, he could be up next for the winner of Galvao vs. Eduardo Dantas. In the night’s co-main event, welterweight veteran Fernando Gonzalez (25-13) made the best of a bad situation, edging a split decision over former TUF 17 contestant Gilbert Smith (12-5) after losing out on the opportunity to fight Michael Page, who withdrew from the card due to undisclosed reasons.